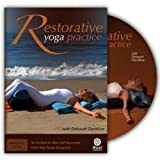 This DVD focuses on restorative yoga, which is the practice of yoga postures supported by blankets and other props so that the poses can be held in stillness for an extended period of time, usually from five to fifteen minutes. Here instructor Deborah Donahue offers six different sequences, four of which are purely restorative, plus a meditation and a slightly more active morning routine. Donahue provides live instruction, teaching in a small indoor studio (although throughout the holds, she is sometimes shown relaxing in more scenic outdoor settings) with flute music playing in the background. During her brief introduction, Donahue notes that the props needed include up to six blankets (the DVD case recommends at least four), a bolster (or a suitable large, firm pillow, such as a couch cushion), a strap, and an optional block. For the meditation, Donahue performs a body scan while lying in relaxation pose (savasana). The meditation focuses on the chakras, or energy centers of the body, with colors representing each chakra appearing on screen as Donahue gradually moves down the body. The Morning practice begins with a 5-minute sun salutation meditation performed in a seated position; this includes focusing on areas of tension while meditating on various colors. Donahue then moves to standing for 5 minutes of half sun salutations, and finally, she concludes this segment with a 5-minute relaxation. Donahue conducts each of the four restorative sessions in a similar manner. For every posture, she begins by describing the setup, including the props that will be required for the pose. Then, after providing guidance on how to come into the pose, she simply allows time to rest in the posture, only occasionally providing additional brief reminders on breath or alignment (and sometimes making small sounds, such as “ahh!”, as well). Finally, she cues coming out of the pose before moving on to the next one. Each practice concludes with the same relaxation segment. Donahue offers three options for relaxation: 1) stretching out in the traditional savasana pose (which she also calls star), 2) lying with the legs elevated on a bolster and the thighs bound together with a strap, and 3) lying with the calves resting over a bolster. Although many yoga instructors encourage their students to incorporate restorative yoga as a regular part of their yoga practice, this form of yoga is rarely offered in yoga media (with the exception of books). The one other restorative yoga DVD that comes to mind, Yoga Therapy Prescriptions (which I also reviewed for this site), is not purely restorative, as it includes more active poses as well, and the restorative postures themselves are not held for nearly as long as the postures here. Therefore, Restorative Yoga Therapy offers a unique opportunity to practice this worthwhile, relaxing, and very gentle form of yoga at home. This DVD is appropriate for all levels of yoga practitioners, although some basic familiarity with yoga terms as well as the use of yoga props would definitely be beneficial.